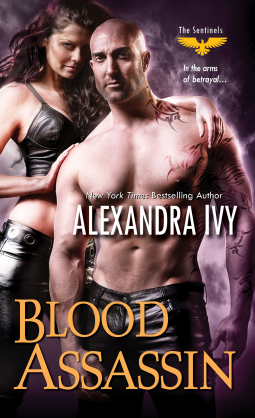 The saga of the Sentinels and their eternal protection continues in Alexandra Ivy’s second in the series, “Blood Assassin”. Fane had made an impressive impact as the guardian of Callie in “Born In Blood” and after handing off her and the special bond they shared to Duncan, Fane is ready to head back to Tibet for some down time. But then fate throws a wrench in his plans, when the love of his life disappears. Not just a powerful psychic, Serra is a rare telepath who can connect to minds with objects and helping to find missing children is her specialty and weakness. A weakness exploited by a high-blood and Serra ends up in St. Louis via a spell to help Bas, a powerful assassin find his kidnapped daughter. Fane is on the prowl as Serra’s guardian, and would lay his life for Serra. And Serra is racing against time to find the little girl so her life can be safe. Amidst danger and betrayal, revenge and retribution, sizzling chemistry and passionate love, Serra and Fane finally consummate their feelings for each other, for a future with each, if they can ever survive the danger they landed in. Alexandra Ivy does another brilliant job of etching Serra and Fane, who are fast becoming my favorites. There is so much love and tenderness between them; you just can’t help loving them. Despite the danger they are in, their relationship just oozes charm, charisma and warmth. And the hint of sparks between Wolfe and Mave is something that I am waiting for Alexandra Ivy to bring to fruition. And I hope there is a closure for Bas and his story. I’ve always loved the way Ivy gives importance to small details, the explanations of situations, the various chapters of history of the Sentinels and Norms, the layers of foundation of Valhalla, and the dynamics of various relationships among them. It is a fascinating exploration of the paranormal, beyond the imaginations of the norm, and a fulfilling experience of reading the story of each of the Sentinels and the woman they are destined to have in life.